Skin treatments are enhanced with proper analysis. The Visia™ Complexion Analysis System allows us to take high-resolution photos of your face and analyze them beyond what we see on the surface. How serious is your invisible sun damage? Are you truly overly oily or simply dehydrated? The depth of superficial lines or wrinkles becomes evident, and we can predict possible issues that will appear over time. Your Visia™ Complexion Analysis results are then compared with a national database of people of your same age, skin type, and gender — and a scientific comparison will show you where your results are in comparison to national averages and what needs to be improved. 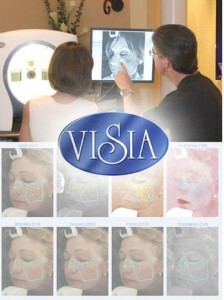 VISIA® starts with a digital photograph of your face which can be used to document the condition of your skin and evaluate the effectiveness of the treatment options available to you. The system generates comprehensive reports to add to your record and with which to track your progress to a healthier, more youthful looking complexion.